The below artworks are the most important by Émile Henri Bernard - that both overview the major creative periods, and highlight the greatest achievements by the artist. Artwork description & Analysis: Bernard was 20 years old when he produced this portrait of his sister, Madeleine, who was 17 at the time. The portrait is life-size and depicts the chronically ill young woman lying in the Bois d'Amour, a small wooded area on the edge of Pont-Aven in Brittany. Reclining and looking upward in her reverie, the body of Madeleine claims the entire width of the canvas, thereby visually splitting the canvas into two distinct parts: her body and the pleasant landscape. Bernard made multiple preparatory drawings on site for the painting, but then produced it in the studio. Cutting through the landscape is the river Aven, from which the village gets its name. The painting was made at the time Bernard was traveling on foot through Brittany and when he met Gauguin who had apparently fallen in love with the ailing younger sister of his new artist friend. The picture marks the moment of Bernard's break with Impressionism once he met Gauguin and began absorbing the latter's ideas concerning Synthetist Symbolism, which was a stark, formal simplification of the elaborate Symbolism of artists like Gustave Moreau and Puvis de Chavannes. With Synthetism (from the French word "synthetiser" meaning "to synthesize"), objects are broken down into solid areas of color and mass while excessive details and any attempts at conveying perspective, depth, or volume are eliminated. The inventors of Synthetism, Gauguin, Bernard, and Louis Anquetin, wanted to emphasize the difference between their work and Impressionism. Whereas Impressionists strived to describe objects in terms of light effects, generally eschewed line, and never relinquished the impulse to create illusionistic depth and volume in their works, the Synthetists emphasized flatness and outlining. They stated that their primary aim was to synthesize the feelings of the artist about a given subject, the supposed "purity" of color, line, and form, and the exterior appearance of forms in the natural world. If Impressionism was about capturing a moment in time as objectively as possible, Synthetism emphasized subjectivity - the emotional impetus of the artist that lay beneath the production of a painting. Artwork description & Analysis: Non-western art, especially that of Japan and the Near East, heavily influenced avant garde artists of the period, including Bernard. Some of the Impressionists including Degas, Monet, and Manet, had begun collecting Japanese ukiyo-e prints and Bernard's close friend, Van Gogh, had begun doing so and had exhibited a number of the prints he had acquired in 1887. The features of the Japanese woodblock prints that most captivated these artists were the bold outlines, flat areas of uniform color, uniform lighting, unusual perspectives (or no perspective), the often radical cropping, and an emphasis on patterns. Additionally, they tended to represent scenes from everyday life, which held enormous appeal for the Impressionists and Post-Impressionists. Bernard and his friends and colleagues, Van Gogh and Gauguin, were also impressed by the ethos of the artists who produced the distinctive woodblock prints. Van Gogh had learned that Japanese printmakers frequently exchanged their work with each other and suggested that the trio do the same. 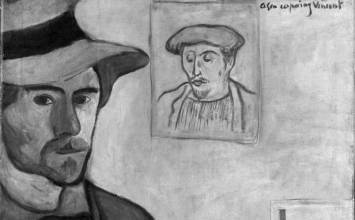 In this self-portrait, not only does Bernard depict himself but he also includes a portrait he was making of Gauguin. The formal similarities with Japanese woodblock prints are evident: the bold outlining, the large areas of mostly solid color, the flatness, and the unusual cropping. Blue dominates the painting, which suggests a kind of melancholy in keeping with the sober expression on Bernard's face. As a kind of double portrait, the image of Gauguin looks down into the studio of Bernard as though the older artist is functioning as a sort of mentor, lips slightly pursed in what reads as a look of disapproval. While Bernard is credited with having influenced Gauguin heavily, the latter never openly credited him and the two collaborators often had trouble seeing eye to eye. Also of note is there is a very similar famous self-portrait by Gauguin, that has Bernard in the frame on the wall, a further sign of the comradery between the two artists. Artwork description & Analysis: Captivated by the supposed primitivism of the country folk in Brittany in northwestern France, Bernard, like Gauguin, attempted to extol the virtues of a simpler life less touched by modernity in his depictions of Breton peasants. In this painting, two Breton women wearing the traditional bonnets and garments of the region are busy picking apples in an orchard on a hill. One woman reaches up to pluck the apples from the branches while another stoops to gather the ones that have already fallen to the ground. Bernard's Cloissonist style is apparent here: the bold outlining and colorful, simplified forms that describe the figures and objects are the two most distinctive traits of the style he developed and which influenced Gauguin among others so profoundly. The style, Cloisonnism, gets its name from the ancient metalwork technique that separates colored glass elements in compartments ("cloisons") with wires. The picture seems to be comprised of flat layers stacked one on top of the next. While the flat brown tree seems to describe the foreground and the steeple establishes a distant background, no other attempts at creating depth or volume are evident. The bodies of the women are distorted and simplified as are the unnatural, red leaves of the apple tree, which resemble large, bright flowers like poppies. The bright but simplified palette was a major characteristic of his and Gauguin's Brittany paintings, with colors meant to evoke a kind of modest and joyful spirituality. Artwork description & Analysis: One of the more prolific self-portraitists, Bernard produced at least one self-portrait per year between 1886 and 1941. These depictions were vehicles not only for personal expression but also documents of his evolving style. This particular self-portrait reveals his engagement at the time with Symbolism. Bernard was apparently enduring a period of self-imposed isolation and reflection. He was mourning the death of his friend, van Gogh, and had broken off contact with Gauguin and was bitterly resentful that the latter had not fairly credited him with the role he played in the development of the Pont-Aven School of loosely affiliated Symbolist artists. He was also in the midst of a low point in his romantic life, was prone to self-doubt, and was struggling to reestablish himself as an artist prone to radical experimentation. In his solitude, Bernard began embracing a form of religious and mystical expressionism that is reflected in this self-portrait. In the foreground of the painting he depicts himself in dark, somber colors looking anxious and introspective. Behind him, bathers - mostly female, but also a male and female couple - form a circle around a Christ-like figure. Painted with a kind of warm, sunset-red palette, these bathers are reminiscent of the bathers of Cézanne, whom Bernard had met. Unlike the somewhat naturalistic palette of Cézanne, Bernard's figures are radiant and seem more like apparitions than the figures that populate Cézanne's outdoors scenes. Yet, by referencing him, Bernard expresses his admiration for the innovative Cézanne. Artwork description & Analysis: In the latter few decades of the 19th century, Pont-Aven, Brittany became a hub of artistic production, attracting a diverse assortment of artists who began meeting regularly in the scenic little village. While Gauguin had left for Tahiti in 1891, Bernard continued visiting Brittany and developing the Synthetist style. Technically, both Cloissonism and Symbolism as practiced by Bernard, Gauguin, and Sérusier were Synthetist styles. The most common feature of a Synthetist work was the emphasis on flat, two-dimensional patterns. The investment of the artists in the spiritual underpinnings of the Synthetist ideology and aesthetic varied depending upon the person. In this Cloissonist Synthetist work, Bernard dispenses with realism and instead creates a work that resembles stained glass: flat fields of color boldly outlined. Forms echo one another: the verticals of the figures and the women, the round shapes of the umbrellas and the hills. The influence of Seurat is clear in this composition of stiffly posed figures and frozen forms. While the palette remains somewhat naturalistic, the simplified forms of the figures and objects creates a space that seems far from the real world, probably in keeping with the nature of Brittany, which had largely remained untouched by industrialization. Artwork description & Analysis: In 1904, Bernard returned to France after spending time abroad, including in Italy, Turkey, and Egypt. He combined his avowal to return to tradition having been influenced by work he saw by Michelangelo, Raphael, and Titian with a Cézanne-style breaking down of forms to colorful blocks placed side-by-side. Shortly after his return from abroad, Bernard traveled to Aix-en-Provence to meet with Cézanne, whose work he had admired deeply for years. The friendship between the two, while mutually satisfying, was largely confined to letter writing and had begun late in the elder artist's life. The dialogue between Bernard and Cézanne captures the essence of that critical moment in the development of modernism. In this work, it is clear that Bernard has completely abandoned Cloissonism as well as Synthetism for a kind of modern classicism as espoused by Cézanne, who evidently during their meeting in the South of France offered brutal criticism of Gauguin and his art. While this landscape is constructed of facets in naturalistic colors, Bernard's former emphasis on flatness gives way to depth. There is a distinct foreground containing the familiar trees framing the picture seen in many a Cézanne landscape; there is a clear middle ground comprised mostly of river; and there is a background - a patchwork city of houses that seem to cascade down the hill. This is a work that strongly anticipates coming Cubism. Artwork description & Analysis: Bernard left France in 1893 and had lived abroad for ten years before returning to his native country. Intrigued by Orientalist works of the previous generations artists - Ingres, Delacroix, and others - he sought to create his own works depicting similarly scenes and characters. This painting, his own Odalisque, features a level of naturalism that is quite new to Bernard's work but certainly in keeping with his determination to return to "tradition" and to reject emerging avant garde experimentation. In this erotically-charged painting, the sensuous female figure, whose breasts are nearly completely exposed and who wears luxurious garments carefully described by Bernard and intended to read as "exotic," glances off to her right rather than meeting the gaze of the viewer. There are no traces remaining of his earlier, more radical style, which emphasized flatness and simplified forms. Instead, the painting harkens back to the Romanticism of the first half of the 19th century as a kind of puzzling regression. His work of the first few decades of the 20th century display a similar level of naturalism, whether self-portraits, still-lifes, landscapes, or genre scenes. First published on 27 May 2017. Updated and modified regularly.